COMPLICATIONS IN PEDIATRIC OTOLARYNGOLOGY. Edited by Gary D. Josephson. Daniel L. Wohl. Taylor and Francis. The possibility of a child choking is one of the most troubling threats to new-borns and infants, presenting both parents and health care providers with unique challenges. In addition, otolaryngology often has been an overlooked component of pediatric medicine — something head and neck surgeons are aware of but don’t really focus their actual practices on. In this text, Josephson (Chief of Pediatric Otolaryngology at Nemours Children’s Clinic in Florida) and Wohl (Professor of Otolaryngology and Pediatrics at Medical College of Virginia) have constructed one of the first texts of its kind to delve into this subject matter. Complications In Pediatric Otolaryngology offers comprehensive study into the problems that sometimes arise with the child-patient. The reader will be treated to discussion of myriad situations, including complications that surface during head/neck surgery of the pediatric patient, emergency airway management and related critical care issues, pediatric otolaryngology imaging, hearing loss, coagulopathy, allergy and immunology, care of the child-cancer patient, pediatric sinonasal surgery, aerodigestive endoscopy, wound healing and ear surgery (to cite highlights). Aside from this being a one-of-a-kind reference stop focused on disease-management of the pre-teen patient, it also offers keen insight into how the physician can best treat children and thus increase the likelihood of more complete recovery. The underlying theme behind this text is to stress to the physician that children differ greatly from adults in their medical needs; in short, the medical community as a whole has a particular responsibility to provide the best for these patients who many times are unable to serve as their own advocates. CUMMINGS OTOLARYNGOLOGY. Head and Neck Surgery. 6th edition. Paul Flint. Bruce Haughey. Valerie Lund. John Niparko. Mark Richardson. K. Thomas Robbins. J. Regan Thomas. In 3 Volumes. Saunders. 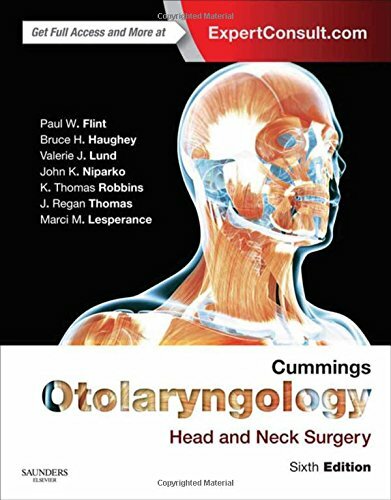 Now in its 6th edition, Cummings Otolaryngology is regarded as the consummate general head/neck surgical reference, noted for its in depth dissection of this ultra-intricate sub-specialty. Cummings draws a complete picture of head and neck surgery, with an array of clinical photographs, drawings and surgical videos deployed as a means to pierce the surface and access core-information. Topics of coverage include the skull base; vestibular implants and vestibular management involving intratympanic and physical therapy-based approaches; radio-surgical treatment of posterior fossa and skull base neoplasms; intraoperative monitoring of cranial nerve and CNS function; pediatric sleep disorders; pediatric infectious disease; and the best approaches available to evaluate and manage the infant airway (to cite random high points). This new edition is noteworthy for its clear focus on advancements in minimally invasive surgical techniques; the idea here to give the most relief to the patient while inviting the least risk. In addition, the most common head/neck disorders likely to be seen by the clinician are isolated, with treatment plans explored in relation to the genetic-basis of the affliction. Over 3,200 illustrations team with 40 procedural videos to augment a text that stitches together the leading voices on head/neck surgery into a single reference. Cummings Otolaryngology has been around through 6 revisions for a reason: the text is both layered and impeccably written, with ease of navigation an editorial priority. Accordingly, head and neck surgeons on the front lines have come to trust the name Cummings in both the clinical and operating room settings. OPERATIVE OTOLARYNGOLOGY: HEAD AND NECK SURGERY. 2nd Edition. Eugene Meyers. Saunders. 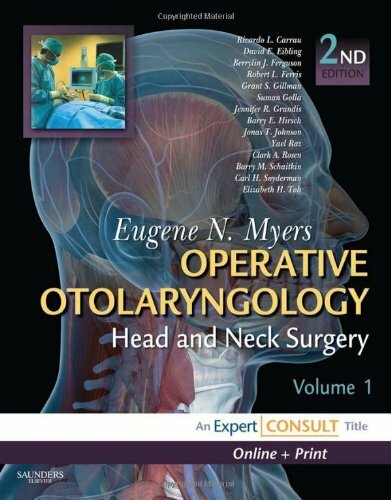 This 2-volume set provides relevant discussion of countless otolaryngologic surgical procedures, including vital chapters on face lifts, blepharoplasty, and myriad endoscopic approaches. Enhanced by over 1,300 illustrations and 90 minutes worth of surgical video footage, these features help to create a perfect companion or worthy alternative to the Cummings centerpiece. SLEEP APNEA AND SNORING. Surgical and Non-surgical Therapy. Michael Friedman. Saunders. During the last twenty-plus years, medicine has come to consider sleep apnea as a serious affliction that impacts myriad other organ systems, causing wide-spread deterioration of the cardiac network in terms of heart failure, hypertension and arrhythmia. 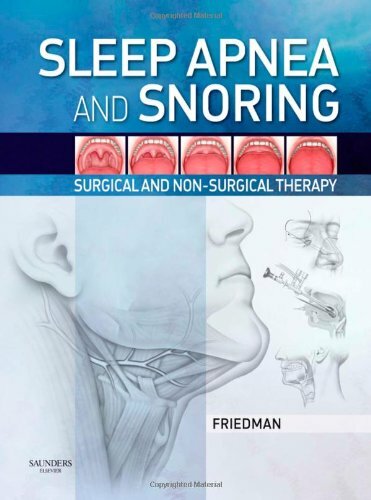 Here, Dr. Friedman has created a multidisciplinary approach to studying both surgical and non-surgical approaches to treating sleep apnea and snoring. Detailed and well-reasoned, Sleep Apnea & Snoring serves otolaryngologists, pulmonologists and internists with equal ease. ATLAS OF AESTHETIC FACE AND NECK SURGERY. Gregory LaTrenta. M.D. W.B. Saunders. This atlas provides a detailed over view of how surgeons should approach procedures of the head and neck. During a time when elective plastic surgeries are becoming more and more common place, this manual illuminates how the physician can best approach these sometimes difficult cases. Moreover, Face and Neck strives to look beyond the instant of knife cutting skin; instead, it expertly guides the surgeon on ways to approach and manage the complicated proposal of invading the delicate tissues that comprise the human face, neck and eye. What’s best about this atlas is the way LaTrenta presents his material: well-organized chapters come complete with concluding summaries that offer the physician clearly delineated reference points. Information is further augmented by full-color illustrations that demonstrate how procedures are performed (rather than merely “lecturing” on paper). This aspect of Face and Neck is quite important because it fosters an immediate interaction between writer and reader – an in depth “hands on” demonstration of the various approaches to facial and head surgeries. This book is written (and recommended) for the practicing plastic surgeon and for other experts dealing with treatment of the head and face. It would also prove useful to Health Science libraries as a general reference text. However, because the book is so specific, it is not recommended as a general classroom text: these outlines presuppose the reader has some mastery of a subject matter which goes beyond the skill level of the medical student. MILGROM: PRACTICAL ALLERGY. Etan Milgrom. Richard P. Usatine. Ricardo A. Tan. Sheldon Spector. Mosby. As spring quickly approaches, it’s once again time for the focus of Ear, Nose and Throat specialists and family practitioners to switch from the flu to allergy. And Etan Milgrom’s Practical Allergy provides a natural starting point. Milgrom offers practical guidance on the diagnosis and treatment of the most common allergic afflictions, along with recommendations for long-term management. The primary care physician referring to this guide will further be assisted by the color plates/illustrations that provide visual direction in terms of identifying common allergic conditions. Fine chapters on Asthma and Allergic Rhinitis (in Core Topics Section), Patch Testing (Procedures/Practice section), and food allergies (Appendix) provide the allergist with up-to-date information on this often debilitating problem that affects millions of people across the world. Milgrom also provides an additional section on Patient Education included on a CD-ROM. This material can easily be printed out and given to patients, thus allowing them to become directly involved with their own care. This section is of particular value to nurse practitioners and physician’s assistants who administer tests, as they now have a means to educate the people whom they are treating. Highly recommended for both allergy specialists and primary care physicians as a “one-stop” guide to treating allergy. Also recommended for University medical school libraries as a core reference with valuable information on identifying various allergic disorders.